Social media marketing is a powerful way to market your business. Instagram is one of my favorite social media platforms. With almost one billion monthly active users in the United States alone, it would be a shame not to tap into this visually appealing and ever-growing market. You know that whole bit about Instagram not allowing more than one link? Well, now there’s an amazing workaround. Learn how to add multiple links on Instagram with Linktree. A better question would be: “Why wouldn’t you use social media for marketing?” It’s free traffic! Of course, you can use paid ads, but that’s just the icing on the cake. What other venue would let you reach millions of people? I can’t think of another method that comes even remotely close. With social media you can increase brand awareness, engage and interact with your audience, market your products and services, and increase traffic to your website. As an added bonus, social media marketing is remarkable for search engine optimization. 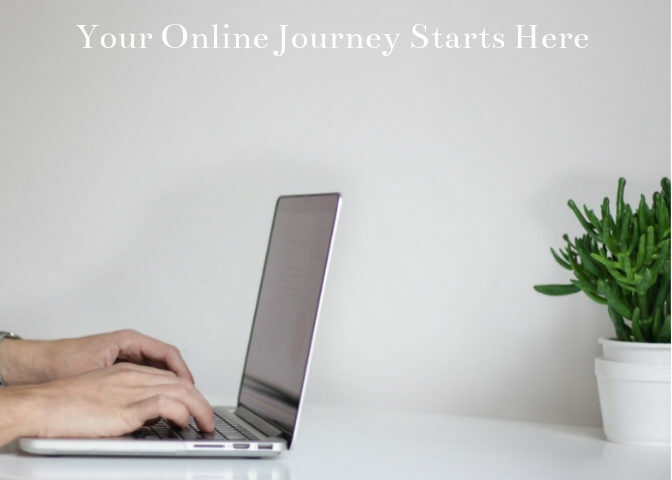 If you’re new to social media, get started today and watch your business grow! 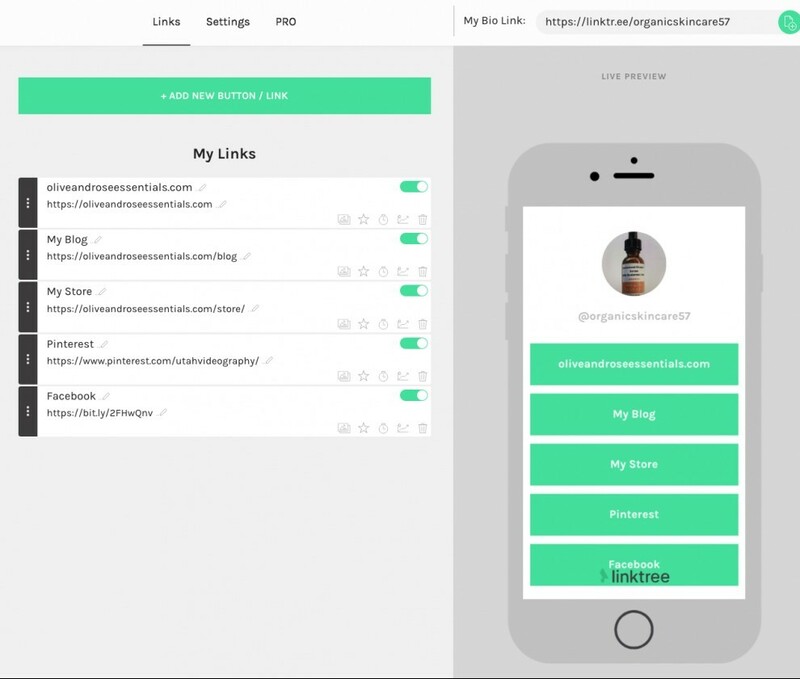 The brilliant concept behind Linktree is the ability to house all your links in one convenient location. Having the ability to post links on your social media account is essential for affiliate and internet marketers. Links enable people to find you, and up until now, Instagram only allowed one link per account. This is a huge bummer because many people are using Instagram to promote their businesses, and links are crucial elements for any business looking to grow their brand and following. Times are a changing though. This is why you absolutely need to set up a Linktree account ASAP. Then you can go haywire will all your links. There used to be just one link, and that was to my website. As you can see, I’ve replaced my website link with the link from Linktree. linktr.ee/organicskincare57. Here’s were the magic happens. When someone clicks on that one and only link, they’re taken to a landing page, where they can see all my links. I could have added more if I’d wanted to. The top link takes visitors to my website, the second one to my blog, and the third link to my store. The remaining two links go to my Pinterest and Facebook business pages. Isn’t that so cool? 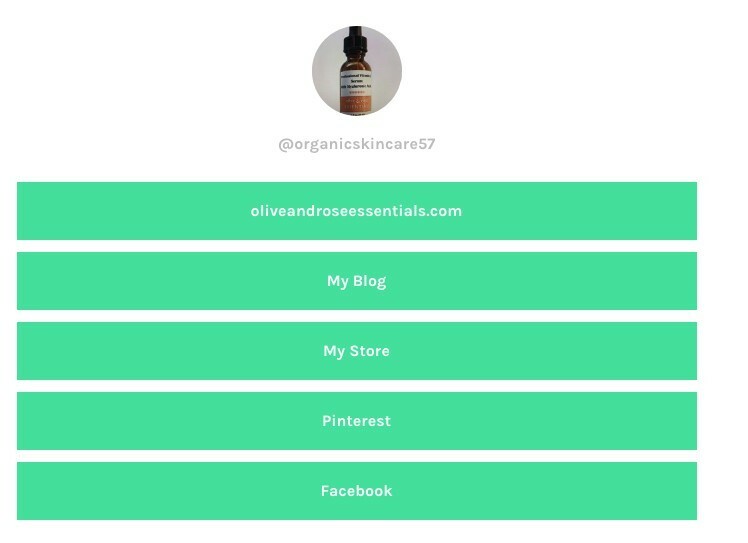 Now you can add affiliate links for your favorite products, links to Etsy and Ebay, links to all your social media accounts, and of course, links taking users to your website and blog. Or if you recently filmed a new video, you’re dying to showcase to your followers, simply post a link to your YouTube channel. These days, one link isn’t going to cut it. And how would you choose which one was the most important? Most people would choose their website or YouTube channel. Now the pain of choosing is no longer an issue, as you can post all your relevant links. What a powerful marketing strategy for your online business! Begin by signing up for a free Linktree account. Then sign up with Instagram. It’s time to start adding your links. Here’s what Linktree’s editor looks like. This is where you’ll be editing and posting all of your links. Click the green button at the top to add a new button or link. You can drag and drop each link by putting your cursor on the black bar to the left. It’s the one with the three little dots. This is a great feature and you’ll need it because the links you add first will be at the bottom so be sure and drag and drop the links into the order you want. Enter a title for each link, and the URL. Note the icons to the right under the yellow slider? You’ll have the capability to highlight your links, schedule them to appear and disappear at certain times, and see how many clicks they’re getting. Keep in mind, that some of the features are for PRO users only. You can also delete links by clicking on the trash can icon. If you upgrade to the PRO version, you can select even more options. See the link in the top right hand corner? That’s the mothership link you’ll want to add to your IG account. It’s now time to go to your Instagram account and add your Linktree link. That’s it. See how easy that was? Now you have all your links in one convenient place for all your followers to click. The free plan fits my needs. It offers all of the basics. There’s no limit to the number of links you can use, and you’ll be able to see the total number of clicks for each link. You can also customize in terms of colors. For only six bucks a month you can enjoy these additional features: You’ll get a breakdown of the daily traffic each of your links is receiving. Customize the colors, fonts, and button styles, while taking advantage of more themes. You’ll even be able to capture your visitors’ email addresses by integrating your newsletter sign up. 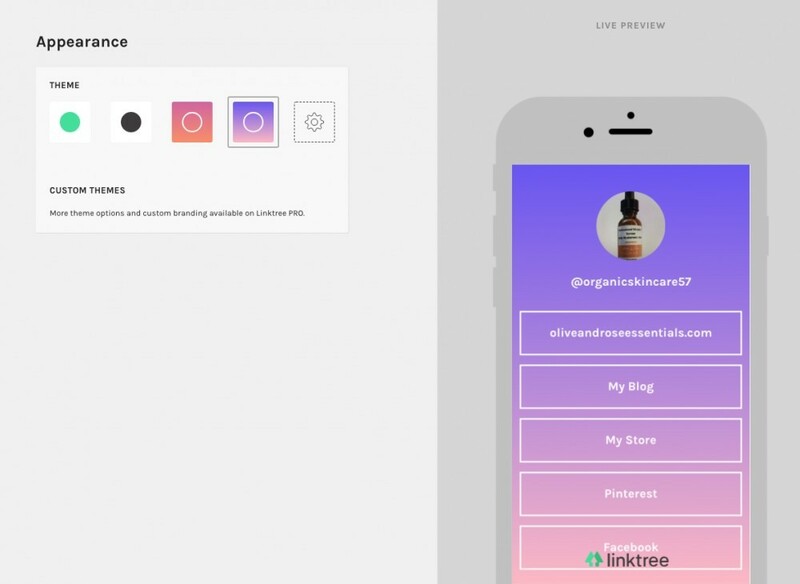 The Linktree branding will be removed with a PRO subscription, and you’ll be able to add background and profile images, along with thumbnails to each of your links. Social media is an integral part of my affiliate marketing strategy. Read my review if you’re interested in how I got started. Take your advertising and marketing techniques up a notch by adding multiple links to your IG profile. This will help optimize your reach, build your brand, and increase your traffic. It’s free and only takes a few minutes to set up. I think it’s nothing short of amazing to have all my links in one spot. What will they think of next?! Do you use Linktree? Do you want to add it to your Instagram account? Please leave your comments and questions below! I’ve seen someone else use this. I was wondering about it. It’s pretty cool. Thanks for sharing this info and the step-by-step guide on how to set it up. I’m not ready to use this tool yet, I’ve only just started up my own website. But I might use it down the road. It seems like the free option is a pretty good deal. Free is always wonderful! Linktree is all the rage right now, and it is pretty cool! The free option suits all my needs. Give it a try when you’re ready! Social media has such an amazing effect on marketing. I am learning about linktree for the first time. Thanks. Indeed social media is an effective way to increase visibility . Do you recommend that one subscribe to multiple social media channels or should concentrate on few ? I have underrated the effect of Instagram, but I think I will pay more attention to it going forward. Thanks for the education. My view on social media marketing is enhanced. You’re so right. Social media marketing is a must in the digital world, and where else can you take advantage of free advertising? Though I’m active on many platforms, my favorites are Instagram, Pinterest, and Facebook. Choose a couple platforms, and concentrate on those, at least in the beginning of building your business.